We have just used Jet The Dog to produce a banner for Charles Wilson Carpets, having heard so many good things about their service and creativity. The process from start to finish was quick, efficient and the final result is stunning. 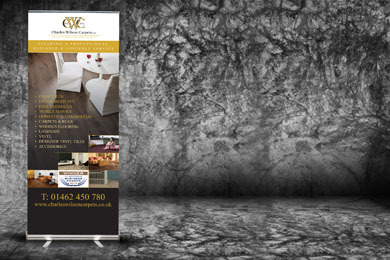 Helen has a true designers eye and she really listens and understands her clients well to give you great brand image. I’d highly recommend Jet The Dog to anyone needing to make their business stand out. Jet the Dog has done great work for us from logo and stationery re-design to one off "not actually adverts". They can even make a small accountancy firm look almost cool! They work with us to come up with ideas we would never have seen without their creativity (we are accountants). They give us exactly what we ask for every time - simple, direct and effective design that works for us. They even did fantastic designs for our 20th Anniversary Party - designed a banner and "backstage" passes so our party looked like a real festival. I asked Helen to design me a set of greetings cards using my Galloway photographs. I was blown away by the design she came up with and was so pleased that my designs looked so professional. The cards are very popular with my customers and i'm so proud of them. Thank you Helen. We used Jet the Dog Design for our new letterhead, business cards and compliment slips and were very pleased with the finished results and the excellent service we received from Helen. I go straight to Helen when I need design work.